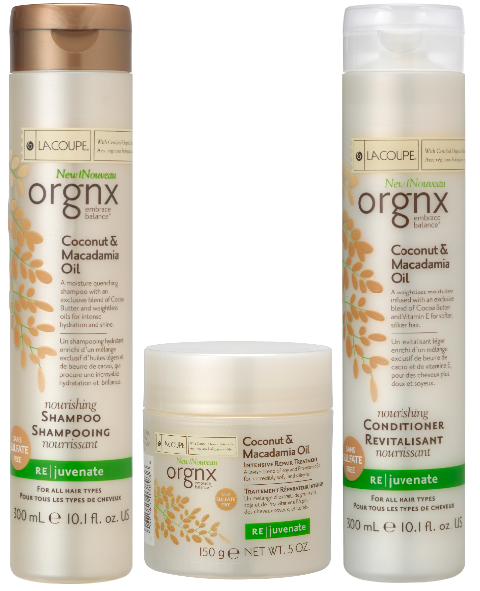 Your hair will go coco-nuts for Marc Anthony, LaCoupe and OGX! 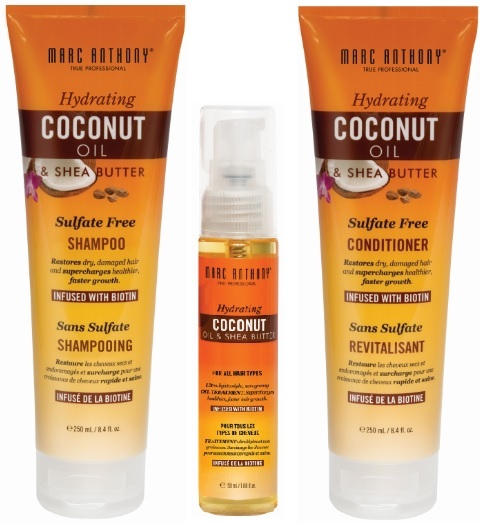 Marc Anthony Hydrating Coconut Oil & Shea Butter -offers nourishment and protection to winter weary hair that strengthens and smooths while it moisturizes and conditions hair leaving it supple and shining. The collection includes: Hydrating Coconut Oil & Shea Butter Sulfate Free Shampoo - 250ml - $10.99 - washes away the accumulation of dirt, pollution, grease and products that clog up your hair and scalp to leave it open to the benefits of the: Hydrating Coconut Oil & Shea Butter Sulfate Free Conditioner - 250ml - $10.99 - with a hydrating formula that helps to smooth frizz and seal in moisture while protecting your hair from pollutants; and follow that up with: Hydrating Coconut Oil & Shea Butter Oil Treatment - 50ml - $10.99 - penetrates the cuticle to help nourish and hydrate your hair leaving it smoother and shiner while protecting it from splitting and breaking. Available at retailers across Canada including Shoppers Drug Mart, Pharmaprix, Walmart and Loblaws. La Coupe Orgnx Coconut & Macadamia Oil - uses certified organic coconut and macadamia nut oils to restore hair's health, softness and shine and for the rejuvenating properties for the hair's cuticle and scalp. The gluten free formula is ideal for those with sensitivities, relieves dry, itchy skin and can help stimulate the hair's growth. Available in the collection are: Coconut & Macadamia Oil Nourishing Shampoo & Conditioner - 300ml - $9.99 - moisturizes hair and scalp while calming frizz and repairing dry and damaged hair. ; and Coconut & Macadamia Oil Intensive Repair Treatment - 150g - $10.99 - improves hair's quality and strength by deeply nourishing and revitalizing course, dry hair for silky smooth hair without weighing it down. The coconut and macadamia oil complex also includes soy bean extract to deeply condition hair and repair it from within. The whole line is free of gluten, sulfates, phthalates and parabens. OGX Weightless Hydration Coconut Water - provides parched hair with residue-free hydration with coconut water naturally derived from young green coconuts - packed with electrolytes to infuse strands with potassium, magnesium and calcium. The formula is then combined with coconut oils for a pure and natural formula that provides weightless hydration that is especially great for fine hair. Available in the collection is a Weightless Hydration Coconut Water Shampoo & Conditioner - 385ml - $9.99 - that provide sulfate-free lather, a clean, residue-free rinse and moisturizers that infuse dry strands with weightless hydration; and Weightless Hydration Coconut Water Weightless Hydration Oil - 118ml - $9.99 - a spray of an extra light blend of coconut water and oils to infuse hair with nutrient-rich non-greasy hydration as well as elasticity and shine. Available at Shoppers Drug Mart, Walmart and Target. P.S. Monetary donations to be used for coconut aversion therapy will be gratefully received. Wow I love the sound of this, coconut is such a great fragrance for shampoos!